Using data from the 2016 Profile of Home Buyers and Sellers we can break down household composition, and the relationship it has to home purchasing choices. Among all recent home buyers, 66 percent were married couples, 17 percent were single females, eight percent were unmarried couples, and seven percent were single males. Three percent of recent buyers identified as gay or lesbian, and one percent identified as bisexual. 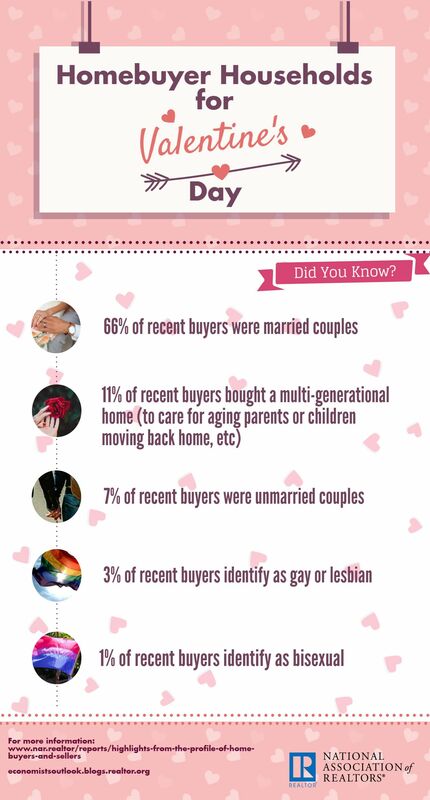 Among first-time buyers, 58 percent were married couples, and 71 percent of repeat buyers were married couples. Among all home buyers, 83 percent purchased a detached single-family home, seven percent purchased a townhouse/row house, four percent purchased an apartment or condo. Eighty-seven percent of married couples, and 85 percent of unmarried couples purchased a detached single-family home. Married couple buyers were typically 44 years old with a household income of $99,200. They typically purchased homes that were a median of 2,010 sq. ft., for $255,000. Unmarried couple buyers were typically 33 years old with a household income of $84,800. They typically purchased homes that were a median of 1,670 sq. ft., for $181,400. Single female buyers were typically 50 years old with a household income of $55,300. They typically purchased homes that were a median of 1,520 sq. ft., for $173,000. Single male buyers were typically 47 years old with a household income of $69,600. They typically purchased homes that were a median of 1,575 sq. ft., for $190,600. For more information on how relationship status and household composition affects homeownership choices, check out the Homebuyer Households infographic, and the 2016 Profile of Home Buyers and Sellers.